As someone who is often on the lookout for savings and greater value, I’ve found online shopping to be a great way to help me save money whenever I need to shop for something. Many of my friends know my style of shopping - only when there are significant discounts. I seldom pay for overpriced items (or even items at full price), unless they are necessities that I can’t run away from. Otherwise, many of my friends who have gone shopping with me before know that if I see anything I like in a physical store, I usually go online to buy it instead, because I can almost always get it for cheaper online. When it comes to online shopping, Rakuten is one such site where I go to compare and get better prices. So you can imagine that when Rakuten approached me to do a post on them in order to create more awareness about their offers, I was only too happy to do so. You see, I’ve already known Rakuten since a while back (when I was doing research on the best e-commerce sites in Asia to shop on) and it caught my attention with its huge variety of merchants (including many Japan shops) and massive price savings. With the weakened yen right now, we can get even more out of our dollar shopping on Rakuten. 1. Be in the know about promotions. One of the first things I do before I start shopping is to head over to Rakuten's Facebook page to see if there are any good discounts or coupons I can use. I prefer to do most of my shopping only when there’s some sort of offer ongoing. To be in the know about Rakuten’s promotions, you can subscribe to their newsletter or like their Facebook page for updates. This way, you’ll always be informed when there’s a good deal happening! 2. Register as a member to get Rakuten Super Points. There are some websites where I always check out as a guest, especially for sites that I hardly frequent. However, for Rakuten, it is more worth it if you register as a member because you get exclusive membership benefits such as birthday rewards and member coupon codes to offset more money off your purchases. Most importantly, as a member, you also get rewarded with Rakuten Super Points whenever you shop! 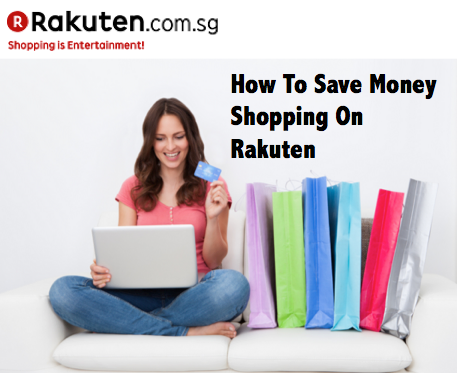 You typically earn 1 point for each $1 spent on Rakuten. Every 100 points will give you $1 to claim off your next purchase. 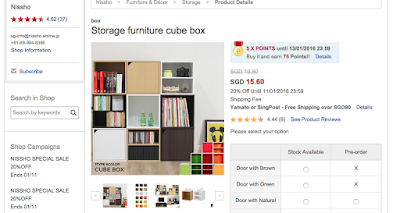 Japanese furniture seller Nisso’s top selling storage furniture cube. Sounds difficult? 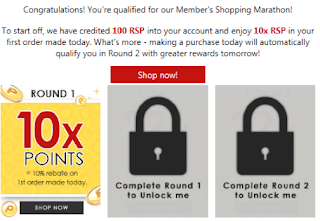 I thought so too, but Rakuten has now tweaked its reward system such that members can now earn 5X points on all purchases. That is equivalent to a 5% rebate each time you shop! The best part is that unlike many other reward schemes, there is no limit on the amount of rebate you can enjoy. 3. Search for Rakuten promo codes. Another tip I always use before shopping online is to look out for any ongoing promo codes that I can use to get even more savings. This method has helped me to save tons of money over the past few years. Flipit and Cuponation are some examples of websites I use to search for such codes. 4. Take advantage of free shipping. One mistake many people make when they shop online is to only focus on the item price, completely discounting the cost of shipping and thus mistakenly thinking that they've saved a lot. I cannot tell you how annoyed I get when I find a cheap bargain, only to have the savings discount wiped off by the hefty shipping fees (especially for overseas items!). For a start, bookmark their Free Shipping page and start your shopping here. I found this cute and useable blackboard sticker going for less than $10 with free shipping! Should I place this in my bedroom or on the fridge door? 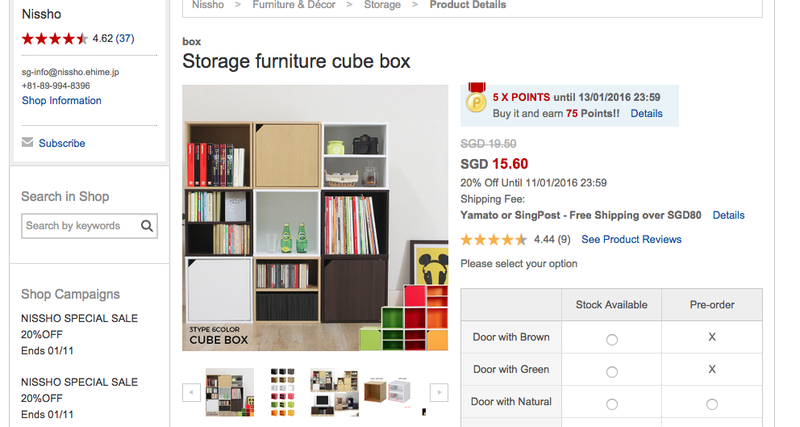 On Rakuten, you can enjoy free shipping on orders above SGD 60. Occasionally, Rakuten also offers free shipping for some merchants, or during a promo, which means you can even get free shipping on some products directly from Japan when that happens. If I’m not in any urgent need for an item, I always try to wait until there’s a promotion or free shipping before I purchase it. 5. Combine orders with friends or family. Not enough items in your shopping cart to hit $60? One easy way to get around this dilemma is to combine your orders with friends or family, so that you can enjoy both free shipping + cost savings on bulk purchases + more rebates into your account! It is no secret that the more you buy, the more savings you enjoy. 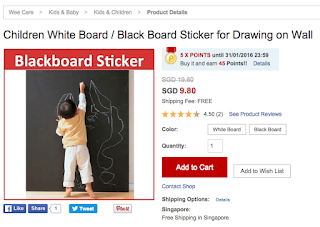 This also works on Rakuten, where you can get significant cost savings by buying in bulk. 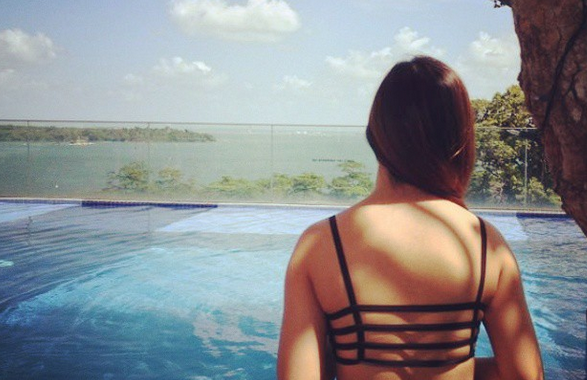 However, if you’re buying just for yourself, it doesn’t really make much sense to buy so much. So the best way is to offer to share with your friends and family! By doing this, you not only get more discounts, but you also accumulate even more rebate points which you can use to offset your future purchases! if you share with a friend during their Buy-1-Get-1-Free promo period! Tip: Make sure the purchases are made through YOUR account, or the points might end up going to your sister / friend instead! 6. Shop around on the Deals page. I've found tons of great bargains under Rakuten's Deals Corner. Enough said. 7. Look out for Rakuten Super Sales. I've also noticed that Rakuten holds Super Sales every few months, which tend to coincide with various holidays and festive seasons - CNY, Black Friday, Great Singapore Sale, Christmas, etc. Shopping during these periods not only gets you better deals, but sometimes also free shipping or even extra reward points! 8. Use rebates to reduce the price of your shopping. As I mentioned, you can use the Rakuten Super Points you chalked up from previous purchases to offset the price of your shopping. But that’s not all. The new rewards scheme gives you 5 Super Points for each $1 spent, which means when you spend $20, you get 5% rebate in points, which translates into $1 off your next purchase. 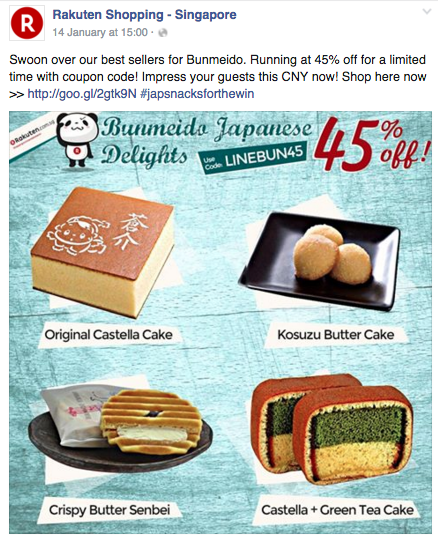 Sometimes Rakuten runs crazy promos like 10x Super Points storewide, or even up to 50x! That's equivalent to a 50% rebate! Some merchants even offer extra points from time to time, so look out for those to further maximize your savings. 9. 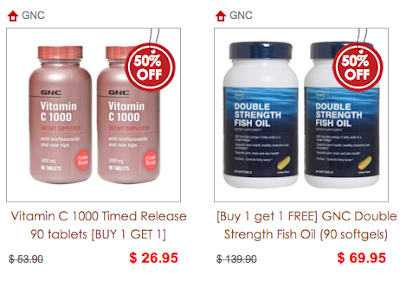 Combine merchant promos with Rakuten’s promos. Great value for money clothes that will give local blogshops a run for its money. 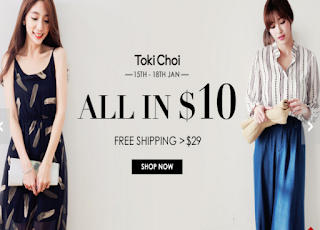 Shop on Taiwanese-based Tokichoi on Rakuten here. 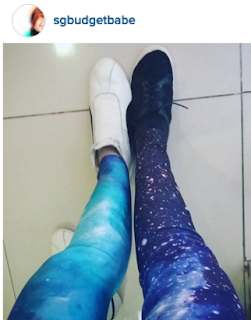 Many merchants also run their own promos every now and then. 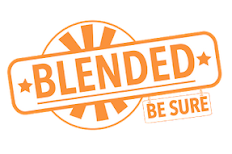 Combine both, and you get the best of both worlds! On Rakuten, you can often stack up promotions - which is something not every shopping site offers. If you don’t mind getting email updates, you can even subscribe directly to individual merchants’ shops so they can inform you when there are promotions. It is not something I personally do, but I know of many friends who subscribe to blogshops so they get informed when there are new launches or any sales. 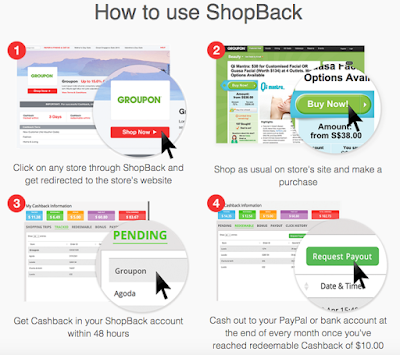 Using a cashback site like ShopBack can add even more layers to your savings! There are other sites like Ebates or BonusBay (3% cashback), but I've found ShopBack to be the best rebate site for shopping on Rakuten currently, as it gives the highest cashback at 5% and is fairly easy to navigate. You can also find coupon codes and promotions on top of cashback. 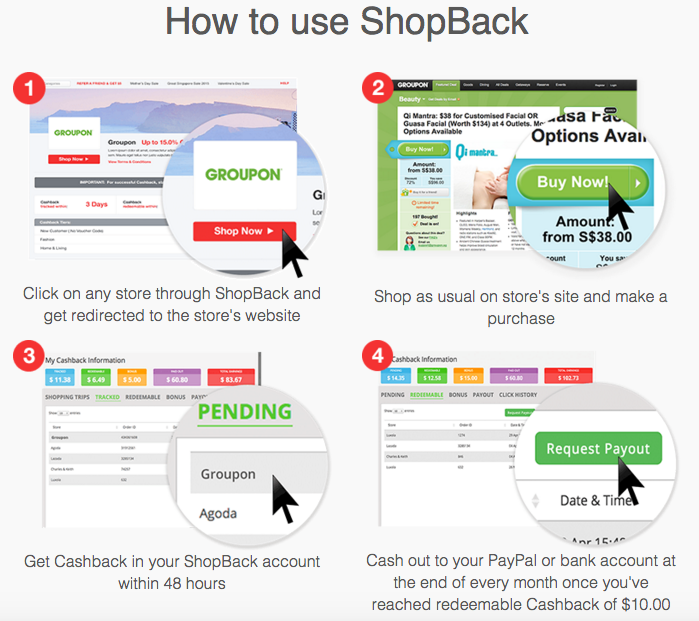 Once you've made your purchase, ShopBack will credit the cash back into your account and you can then withdraw that to either your PayPal or bank account at the end of the month. Just make sure you shop directly through the ShopBack browser and not in a separate tab/window, otherwise you will not qualify for the cashback. 11. Use your credit card to pay. I’m a huge fan of using my credit card to pay for my purchases, because that gets me rewards points / cashback / airline miles / discounts as I shop. Furthermore, if you’re a OCBC 360 or UOB One account holder, you get additional interest if you chalk up a minimum of $500 on your credit card each month. 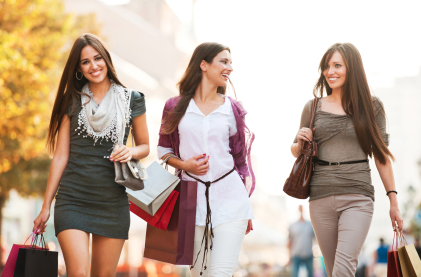 If you own a MasterCard, try shopping only on Tuesdays - that's when they run MasterCard Tuesday where you get 5% off. There are a few other credit cards like Citi Rewards Card or DBS Live Fresh Platinum Card which entitles you to discounts too, but some of them require coupon codes, which is where you need to go back to Tip #3 above! 12. Stand to win up to $1000 worth of Super Points in the Rakuten Ang Pao Giveaway! To celebrate CNY, Rakuten has collaborated with Nuffnang and will be giving out $1000 worth of Super Points (100,000 points) each to 3 bloggers and their first 50 readers. 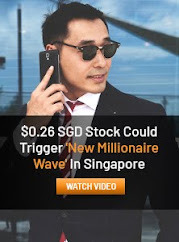 Nuffnang has asked me to join them in this giveaway, and I intend to split this $1000 equally, which means you'll each be getting $20 worth of points if we win this together. 2. Sign up as a new member. 3. Input the email address you used to register on Rakuten in this form. -Contest runs from 25 Jan 2016 to 29 Feb 2016. -Points will be credited into your member account on 8 March 2016. -Rakuten reserves the right not to award points to accounts deemed as fraudulent. This post is brought to you by Rakuten Singapore. All opinions and recommendations are of my own. Great job for publishing such a beneficial article. Your blog information isn’t only useful but it is additionally creative with high content too. Now a days everyone looks for deal of the day items in online shopping. Great information thanks to share. 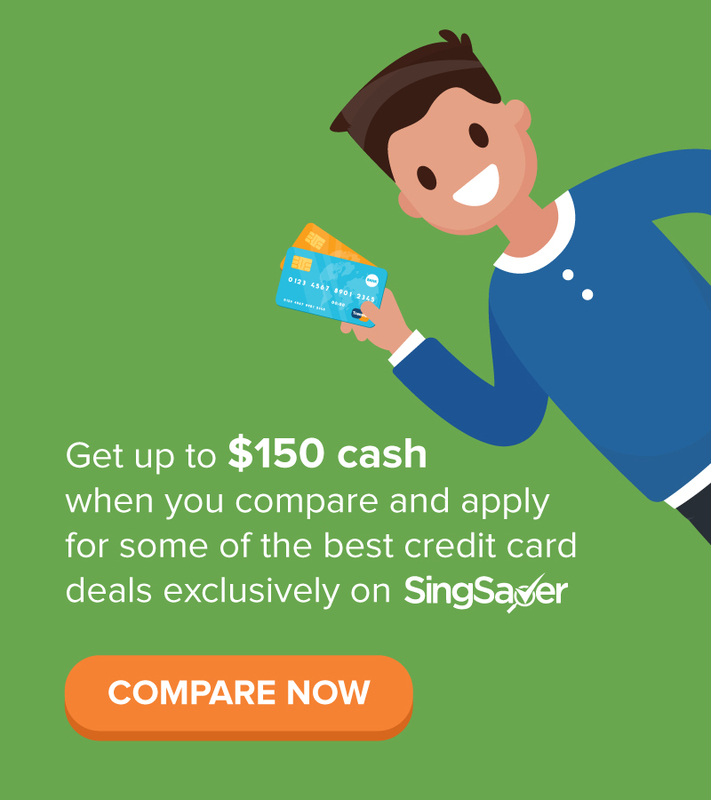 Get latest coupon and discount codes for online shopping from https://sg.paylesser.com/. Did you know you can shorten your long urls with LinkShrink and get cash from every visitor to your short urls.